As a landlord, you may have already learned that the best motto to conduct business by is “expect the unexpected.” Unfortunately, you never can know what to expect from tenants, even if, by paper, they seem perfect. For this reason, it is imperative that you have a binding commercial real estate contract in place and, more importantly, that you understand your rights—especially when it comes to commercial evictions. If you have a problem tenant and want to know how you can go about evicting them in a legal manner, reach out to the experienced Fort Lauderdale commercial real estate lawyers at the office of Edward J. Jennings, P.A. Our attorneys can assess the facts of your case and advise you on how to best accomplish your objectives without violating any laws. A lease between a landlord and tenant is a binding contract, so long as it does not violate any of Florida’s lease laws. That said, if a tenant agrees to a provision, he or she is required to abide by it, even if later on he or she decides that it is “unfair” or “inconvenient.” That said, commercial leases are also subject to a host of unique conditions and provisions not typically found in residential leases. For this reason, commercial evictions are much more complex. If you want to ensure a successful and smooth eviction, review your contract for any direct violations and start there. Most commercial lease breaches are the result of failure to pay rent. 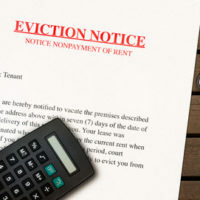 Unfortunately, the eviction process in these instances is similar to a residential eviction process: you must first provide the tenant with a 10-day written notice demanding them to make the rent payment or vacate the property. If the tenant does neither, and if the 10 days has passed, you must file a complaint with the court, which will initiate the eviction process. The court will do more or less the same: demand payment or require that the tenant vacate the property. In some instances, the court will demand damages for the landlord’s troubles as well. While recovering one’s property would be ideal, Florida law states that a landlord may not recover possession of a property in default unless he or she has established that the property is abandoned and that it has been abandoned for 30 days. If you cannot affirmatively establish such a fact, you may be able to demand double rent. You are legally entitled to double rent with each passing month and until the tenant has vacated the property. Sometimes, a landlord may choose to evict a tenant for a reason other than non-payment of rent. For commercial properties, this is typically because of improper use of the premises. If you want to evict your tenant for using your property in a way that goes against the contract, you must specify the exact provision that the tenant is violating. This can be difficult to do, especially if the violation is not a direct one. If you rent commercial or residential property in Florida, the best thing you can do for you and your business is to keep a Fort Lauderdale commercial real estate attorney on retainer. Most landlords end up causing more headaches for themselves by attempting to remedy situations on their own. You can avoid costly mistakes by working with a skilled attorney at every aspect of the renting stage, including the contract-drafting stage. Help your business run smoothly and contact the office of Edward J. Jennings, P.A., to schedule an appointment with a knowledgeable lawyer today.